"Many years ago I was with a party of eight citizens who followed the trail of a bunch of Indians making a raid into the settlement southwest of San Antonio. About 10 o'clock one morning we overtook the Indians as they were crossing the bed of a small dry stream, but in which there was a pool or lake of water, and here the Indians stopped to let their horses drink. We fired upon them whilst at this pool and two of their number fell. Then we charged them and they scattered, according to their natural tactics. A short distance from the stream one of our party killed the horse of one of the warriors and the Indian himself was wounded, though we did not know then the extent of the wound. This Indian crawled into a small ravine near where his horse fell, and myself and two companions dismounted and approached. I called to him in Spanish telling him that if he would quit fighting we would not hurt him, and would do what we could for his wounds. I do not know whether he understood me or not, although many of the Comanches did speak Spanish. He made no reply, but as we approached him, arrows from his bow whizzed by us at frequent intervals. He was down on his back, propped against the side of the small ravine, or gully, and we could see that he sprung his bow by placing it over his right foot, and adjusting the arrow with his left hand. We were near enough to see that he was bleeding from several wounds, but he apparently had no idea of giving up the fight. Finally one of my companions made a 'good Indian' of him by shooting him in the head. When he was dead we examined the body and found that his right arm and left leg were broken and that he was shot through the spine. We camped that night at that pool, after returning from a fruitless pursuit of the rest of the party, and we hollowed a shallow grave with our hatchets and butcher knives, and we laid that dauntless son of the forest to rest without scalping him, and piled a large quantity of rocks over his lonely grave." Another instance of Indian stoicism and indifference to death is related. A good many years ago there lived in Blanco county, Texas, then a sparsely settled section subject to frequent Indian raids, a family named Tanner. One member of the family, Sol Tanner, became quite noted as an Indian fighter, and in 1858 he became captain of a company of Texas Rangers. Prior to his elevation to the rank of captain, however, when a party of citizens was made up to follow a raiding band of Indians, Sol Tanner was always among the first to respond to the call and reach the rendezvous, and was usually chosen to lead the party. He was a dare-devil sort of fellow, and no scheme was too wild or foolish for him to take part in. On one occasion, Sol Tanner came upon a small party of Indians, the latter being taken completely by surprise. The Indians scattered like partridges and a running fight ensued. Tanner and one companion, who were well mounted, pursued one of the fleeing Indians until the warrior had discharged his last arrow at his pursuers. The Indian's horse was failing fast and his pursuers gained on him rapidly. Instead of killing the Indian, Tanner, who was an expert cowboy, fixed his lariat and roped or lassoed the Indian, dragging him from his horse. The Indian was stunned by the fall, and the two white men bound his arms behind him, took his tomahawk and hunting knife from him, then tied him on a horse and brought him to the Tanner ranch as a prisoner. There was a vacant cabin at the ranch, and in this cabin the prisoner was placed. 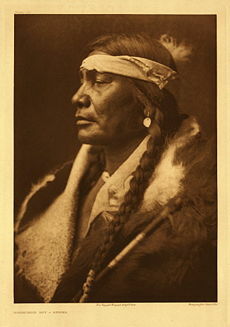 Food and water were offered to the Indian, held to his lips in fact, his arms being tied, but he closed his teeth and refused to take anything into his mouth. The white men did all in their power to assure the Indian of safety, and induce him to take sustenance. His captors were in a quandary as to what disposition to make of their prisoner. On the evening of the fourth day it was evident that the prisoner intended to die by starvation unless otherwise dispatched. Several neighbors came in and a consultation was held. Some of them wanted to turn the Indian loose, but they knew of course that if this was done, and he reached his people in safety, that he would be on the warpath again as soon as an opportunity offered. A vote was taken as to whether the prisoner should be released or executed, and the latter proposition carried. Accordingly the prisoner was taken into the woods about half a mile from the ranch, shot to death, and buried under a large spreading oak.